Scuba Service Technicians Training Program. Abyss Scuba Diving as part of its diving career program offers its trainee PADI Instructors the opportunity to undertake a Scuba Service Technicians training program. During the recent Service Technician Training program at Abyss Scuba Diving in Sydney, we covered service procedures for Oceanic, Hollis and Aeris diving equipment. 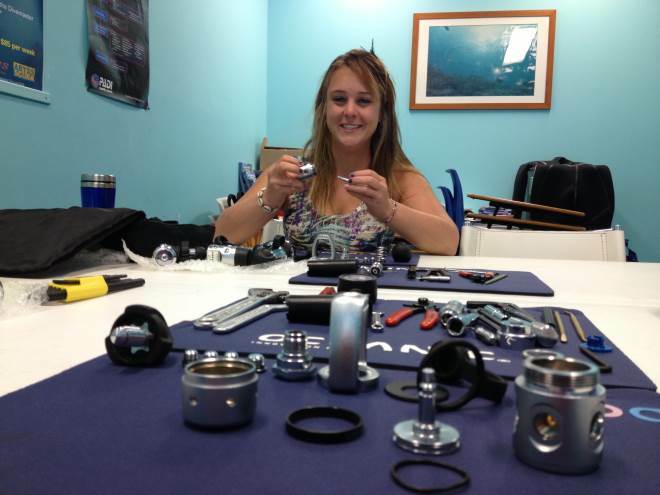 Marnie Cadden worked closely with both Carl Fallon (Our Service Technician Trainer and PADI Course Director) and also our full-time Service Technician Brett Poole, to develop her skills in this area. The course started off by covering the basic service procedures and protocols required to professionally service scuba equipment. 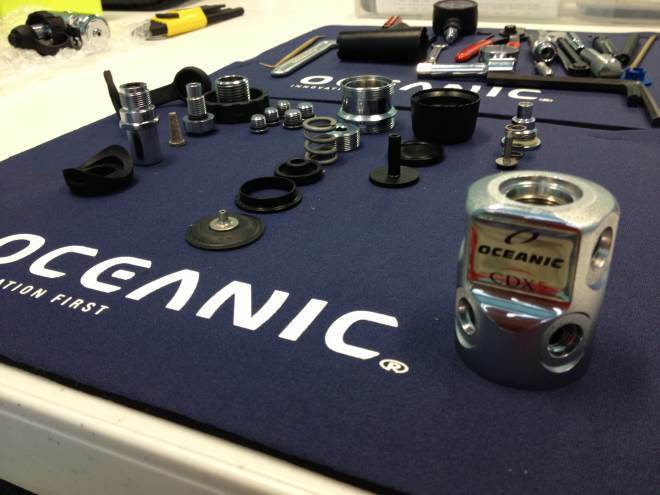 After the foundations of servicing where covered, we moved into a hands-on workshop where we reviewed all the disassembly, reassembly and tuning of all Oceanic, Hollis and Aeris diving equipment. This involved closely following the correct procedures outlined by the manufacturers. After Marnie had finalized the typical service program that is outlined by the manufactures, she continued to develop her skills while being mentored by Brett Poole. During this stage, she was integrated into the service department of the training facility where she was shadowed by Bret while overhauling and troubleshooting some of our facilities regulators. This allowed Marnie to put into the play the skills she had been developing leading up to the mentoring. Overall, Marnie did a truly fantastic job and excelled during the training. She was extremely thorough in everything she did, and followed the procedures to a T. Marnie is now well on her way to becoming a fantastic and well equipped Service Technician ready to be working in a dive centre.